December 24, 2013...Merry Christmas everyone!!!! Even though our trip to Curacao was almost a couple of years ago, I thought I would share a trip report on the birds we saw while visiting the island. Curacao is an island in the Caribbean Sea off the coast of Venezuela. It was a great vacation planned for both hubby to enjoy his snorkeling and for me to see some cool tropical birds. We stayed at the Marriott beach Resort, which was great for birding just by itself. We saw many of the Orioles at our table for breakfast, I was amazed at how well birds can open sugar packets. 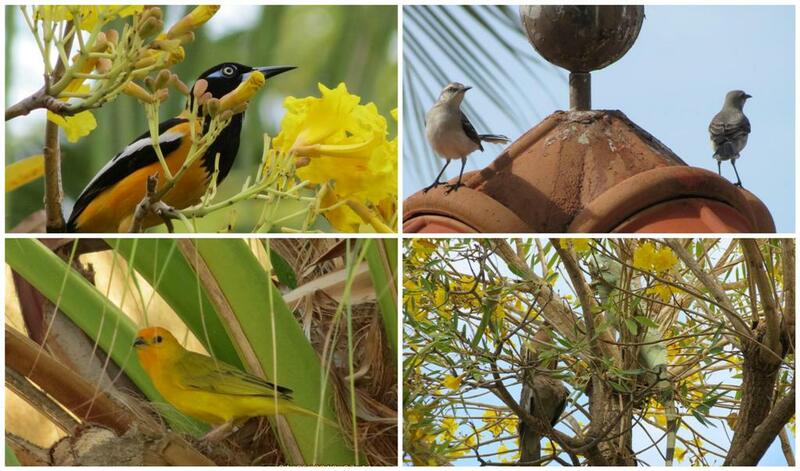 There were many Doves, Bananaquits, Tropical Mockingbirds and Saffron Finches were seen all around the resort. 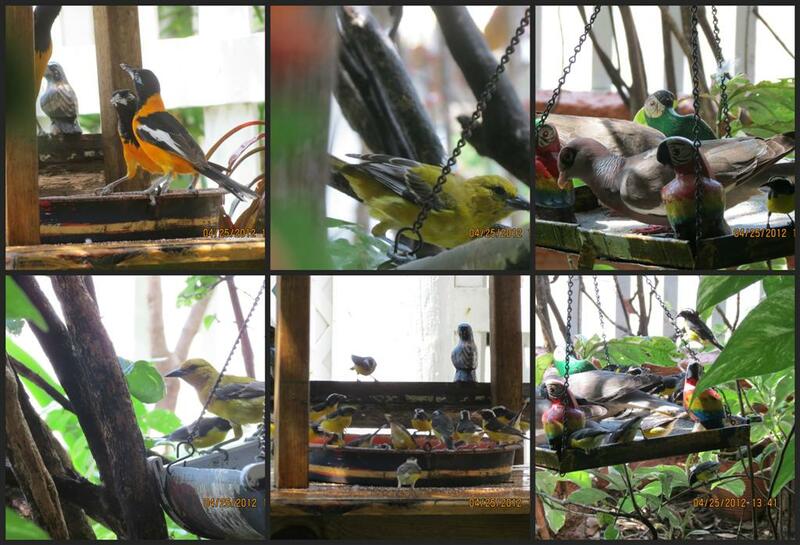 On the top row is the Troupial is one of 25 or so of the New World Orioles. The Troupial or "Turpial" the Spanish name is the National Bird of Curacao and can also be found on Bonaire, Aruba and in South America. The eyes on the Troupial are cool, I love the blue color on the skin that surrounds the eye. 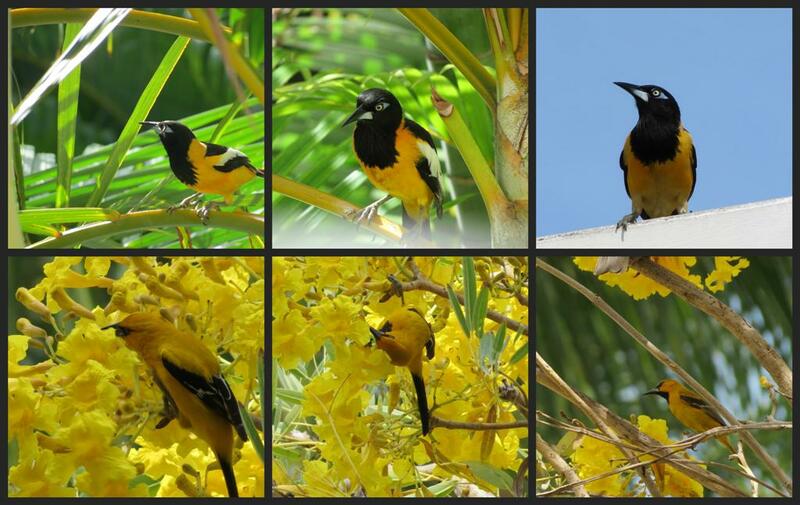 The bottom row Trupial Kacho a Yellow Oriole. One day, hubby and I rented a car and drove around the island. At first it was more like we got lost, we did not know there was a detour and missed a turn. But, this turned out to be a good thing because we found the one of the Curacao birds that was on my wish list of birds to see. The Pink Flamingos at the Salt Flats. 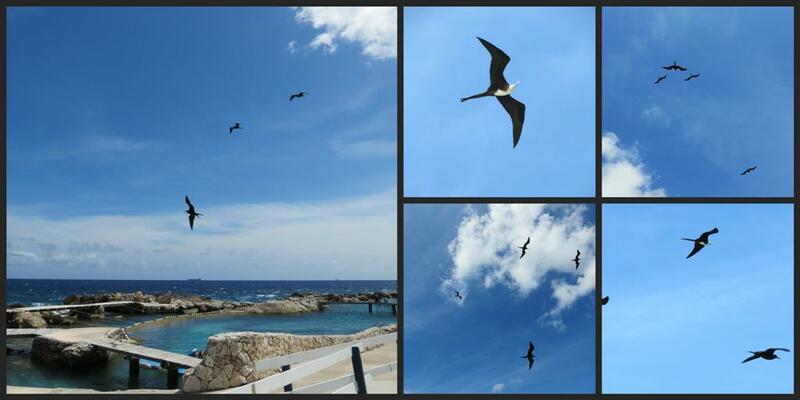 While visiting the aquarium we were able to watch the Magnificent Frigatebirds put on a aerial show. I believe they were looking for a free meal. Also, seen at the aquarium the Brown Pelican and some unidentified Terns and gulls. Another stop during our drive around the island was the Shete Boka Nat'l Park. I was really enjoying the birds at the sugar feeder. 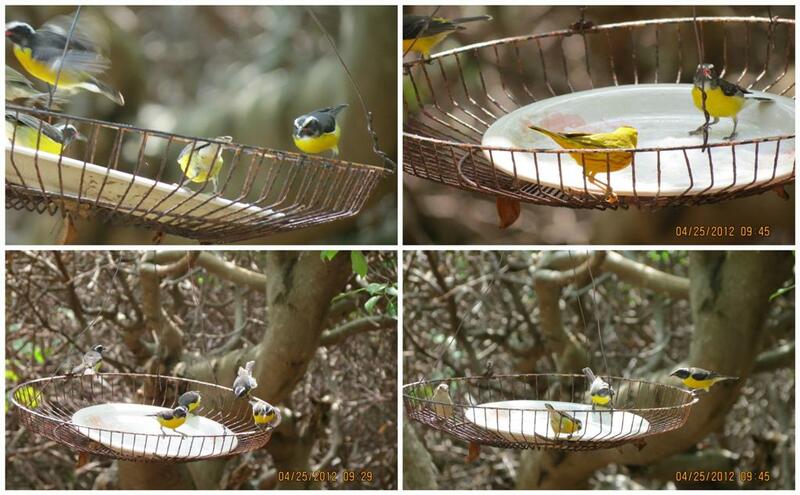 Here are a few of the Bananaquits. Another bird from the park is the Black-faced Grassquit. It seems like a weird name for this cute bird. It is considered a Tanager and is known to breed along the coast of Venezuela. 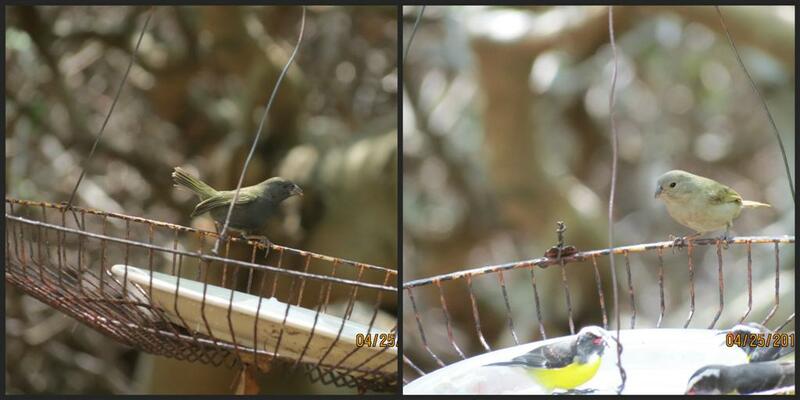 The male is olive green above and has a black head and breast. The female and the immature are dull olive-gray and paler gray underparts. While driving the roads im Curacao, I came across the Crest Carcara on the ground..I did read they search for carrion or hunt for live prey. Also, seen on the road to the park was an American Kestrel. Jaanchies is a local island restaurant located in Westpunt, Curacao. I had read reviews on Trip Advisor before leaving home on this restaurant, so I knew exactly what to expect. I was going there to see Jaanchies birds. Boy, was I pleased, it is a quaint place with bird feeders hanging all around the open air restaurant. It was extremely hard to eat when my eyes were following all the birds around the restaurant. Here is a list of some of the birds we saw at Jaanchies: lots of Troupials, lots of Trupical Kacho, Bare-eyed pigeons and amazing numbers of Bananaquits. Outside of the restaurant were chickens and we saw some more green parakeets. I LOVE JAANCHIES...I would highly recommend this restaurant. The Rufous-collared Sparrow was a bird seen all around the island.. On this day I saw them at the beach..They were under the beach chairs and all around the snack shop. The Yellow Warbler below is a bird I saw while in Curacao. 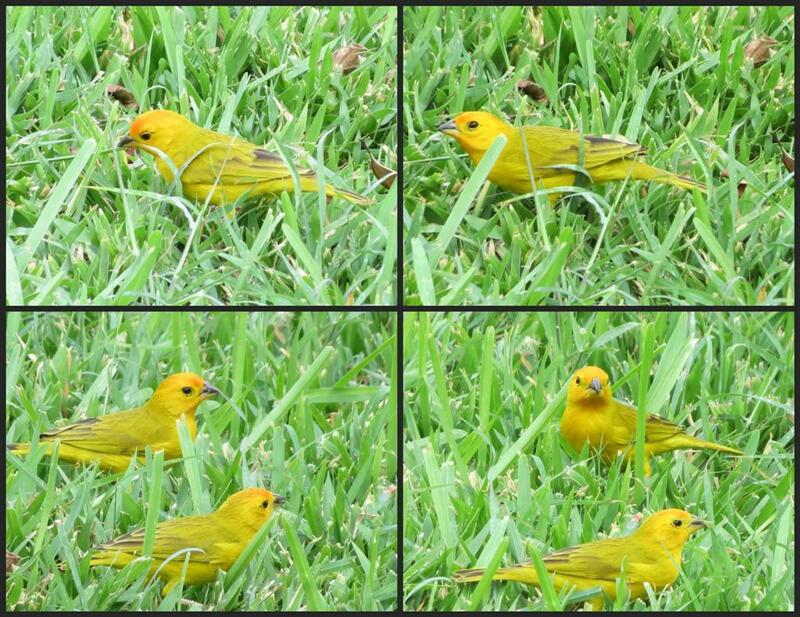 There is definitely a difference between the Yellow Warbler in Curacao compared to the Yellow Warbler I see here in Maryland during the summer. Also, seen around the beach I enjoyed a small flock of Brown-throated Conure (parakeet) or also known as the Curacao Conure. 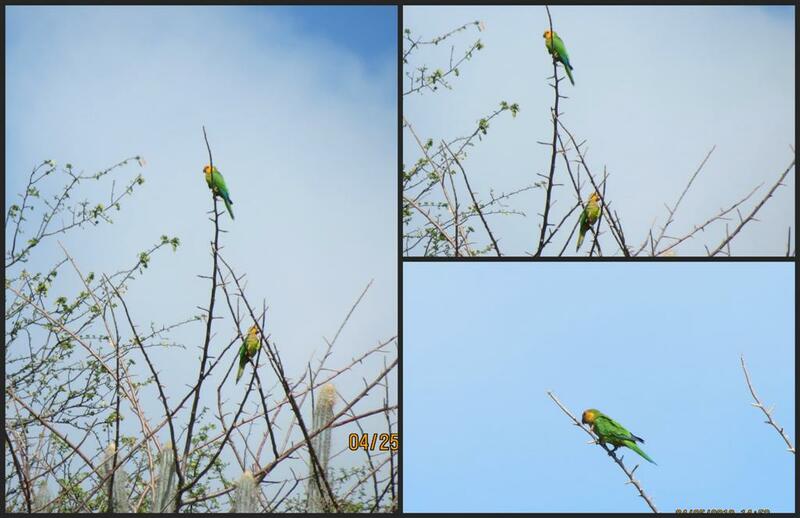 I read that there are 11 sub-species of this parakeet in this part of the Caribbean and South America. The Saffron Finch is a Tanager from South America. Of course they are seen in the Netherlands Antilles. The male is bright yellow with an orange crown and the females are a slightly duller version of the male. They prefer live food like insects but I have seen them at feeders. The Saffron Finch was one of my favorites birds I from Curacao. 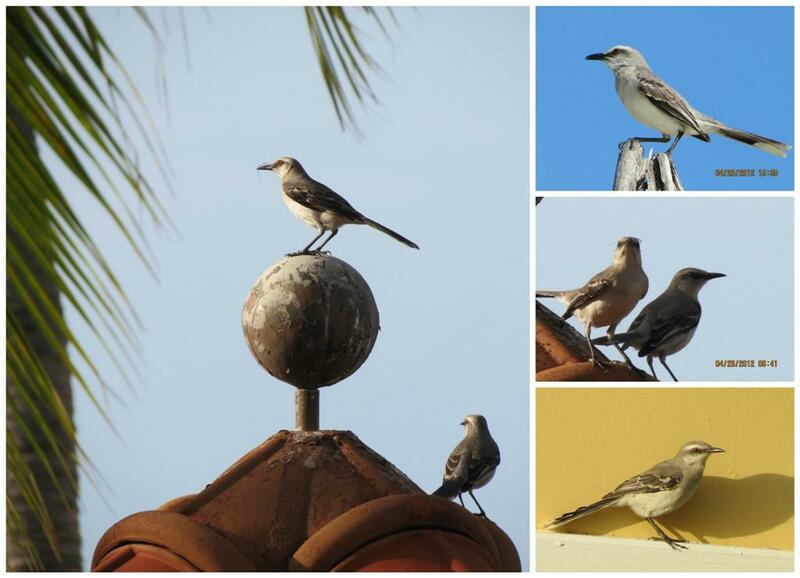 The Tropical Mockingbird was found all around our resort and the island. Above is the Bare-eye Pigeon. This bird has a striking ring of flesh around the eye, giving it a comical appearance. In flight you can see their white-wing patches. I could go on and on about this trip to Curacao, if you are looking for an island vacation with some birding this was one of my favorite places. I hope you enjoyed the post and birds, thanks for the comment and for stopping by. This is also the day I link up my Viewing nature with Eileen post to Wild Bird Wednesday and Nature Notes Thanks to Stewart for hosting Wild Bird Wednesday and to Michelle for hosting Nature Notes. Wishing everyone a very Merry Christmas and all the best in the New year 2014..HAPPY BIRDING. Wow, what a sunset!! And you saw so many cool birds on your trip. The frigate birds are interesting to me, and I love the photos you got of them. All are really wonderful. You must've added quite a lot of birds to your life list. You did a wonderful job of organizing all these different birds. Love seeing orioles. Some of your birds seem so exotic! Hi,Eileen. Nice captures. Curacao looks like a paradise for many people. Birds are very beautiful. The sunset photo photo is very fantastic. Thanks for sharing. 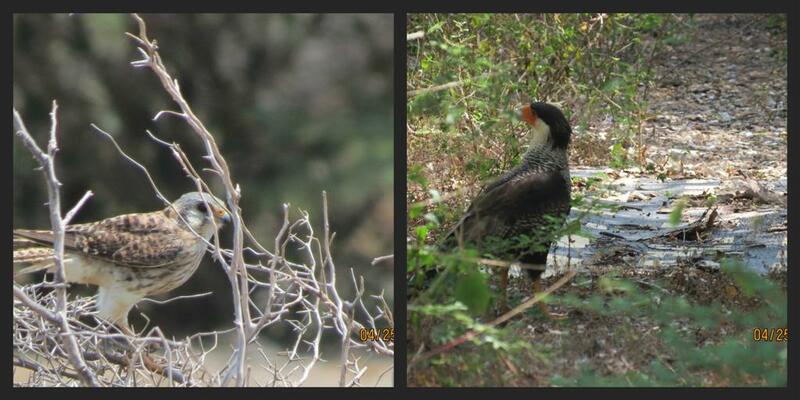 Wow what a variety of amazing birds you captured Eileen. I love them all, each one is special and beautiful. what wonderful birds, I've always wanted to see frigate birds and the troupial is amazingly pretty. a beautiful bunch of colorful birds. i think my favorite was that cute collared sparrow, though. Wonderful shots of the colorful, beautiful birds. I hope you and your family have a wonderful Christmas! Wonderful birds Eileen!! !So colorful!! !Great photography!!! Nice captures!!!Wow!! !What an amazing sunset!!! Wishing to you and your family,Merry Christmas and happy holidays!! Wow, great post, Eileen! 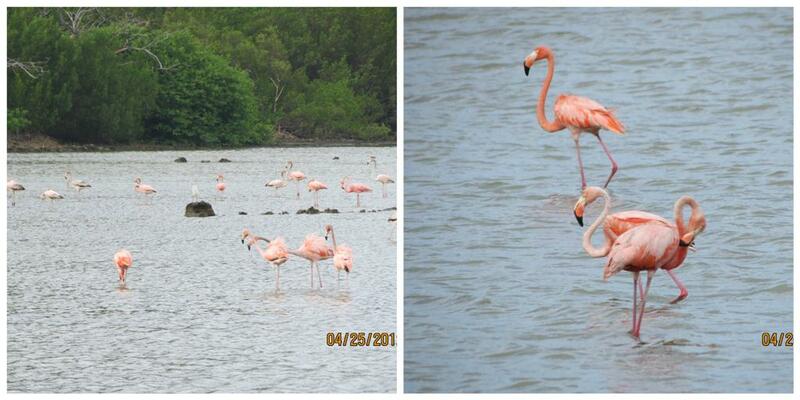 You encountered so many beautiful species...love the flamingos! Wishing you a very Merry Christmas! Such colorful birds! And gorgeous sunset. I really like the orioles and flamingos. Great shots! Great photos of beautiful birds. It must have been a wonderful trip. btw all those photos look more like Christmas down under right now! It's not quite 7am and HOT already! Merry Christmas and I have enjoyed your blog so much and I also enjoy this blog. All of these photos are wonderful ..I like the Saffron Finch. What a trip! cheers. Breathtaking and captivating. Looks like Curacao is a paradise on earth ! Οh !!! What a great post ! I can not decide which is the most beautiful !! love ,joy ,peace and many trips !! Gorgeous birds! What a wonderful place to go on vacation to. You certainly get about, Eileen. Some interesting birds there too, so it sounds a great place to visit. Gorgeous birds galore! Eileen, I so enjoyed scrolling through this colorful post. 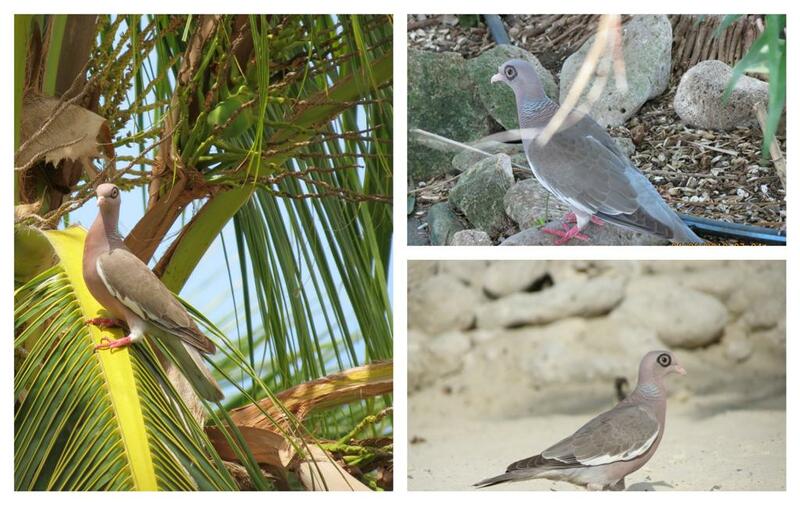 Curacao sounds like a marvelous place to view stunning birds. It's always fun to view birds not seen in the United States. Terrific images! Wishing you and your family a healthy, happy New Year!